Southgate Green marks the old village green, which at one time featured fine elm trees; the hamlet was so-called due to its position as the main southern entrance into Enfield Chase. Once heavily wooded until around the C16th, Southgate remained a small rural community until the C20th when the coming of the railway encouraged housing development. Around the Green are a number of fine C18th and C19th houses, which include the old village inn. The Green is now a series of green spaces divided by roads, within one of which are the replacement of the old village stocks, erected here in 1953 after the originals were lost in WWII. LBII*: No 4 (Essex House), No 5 (Arnoside House) & forecourt walls, railings, gates. LBII: Nos 2 (Old House), 3 (Essex Coach House), 5 (Arnoside Cottage), Ye Old Cherry Tree Inn; Nos 23-32; Nos 38 & 39 (Sandford House & Norbury House). Locally listed: No 40 (Ash Lodge), No 41. 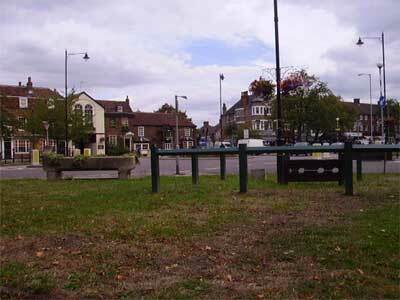 Southgate Green marks the old village green, which at one time featured fine elm trees. The hamlet of Southgate was so-called due to its position as the main southern entrance into Enfield Chase. The area around the Green and the old village inn, The Cherry Tree, was once a separate hamlet known as South Street, but by the mid C19th the two merged as Southgate. The Cherry Tree may date from the late C16th, but was definitely established by 1695, and once had a fine skittle alley. It became a posting inn with stables, and in the early C19th was a meeting place for local Friendly Societies, as well as providing public rooms for social functions before there was a village hall. Edward Walford describes Southgate in the 1880s : 'The shops and villas which compose the village border the high road for some distance, or are tastefully grouped round a green, which once was fringed by tall and shady elms. A few of these monarchs of the forest remain. . . '. Once heavily wooded until around the C16th, Southgate remained a small rural community until the C20th when the coming of the railway encouraged housing development. Around the Green are a number of fine C18th and C19th houses; to the west is the parish church of Christ Church (q.v. ), although the parish was part of Edmonton parish until 1881. Nos. 23-31 Southgate Green are a group of 3-bay rendered houses built in 1777 for local landowner Richard Goad as almshouses for paupers, which were reconstructed in 1981. They may have been designed by Michael Searles, who was responsible for fine Georgian building elsewhere in London. Today the Green is a series of green spaces divided by roads, within one of which are the village stocks, which were restored in 2002 by Southgate Green Association. These are in fact replacement oak stocks, which were erected in 1953 as a coronation gift to the village, after the originals were lost in WWII. There was once a pond on the south side of Southgate Green known as Duchess Pond after the Duchess of Chandos who lived at Minchenden House until her death in 1813. Little remains of the Minchenden estate grounds apart from a small public garden, Minchenden Oak Garden (q.v.). Duchess Pond was later filled in in 1928 when the area was redeveloped and large houses erected beside the Green. Until 1932, a Georgian house called Grove House was on the north of the Green, once the home of Arthur Rowland Barker (d.1915) and his family. Barker was Church Warden at Christ Church for many years and as an architect he designed a number of buildings locally including the village hall, Palmers Green town hall and Southgate Club in Chase Side.